As that yellow ball of fire was bidding good bye on the 20th of April, I headed towards my university grounds. I was unsure how to handle that swelling excitement as I was about to embark on my first ever trekking expedition! As cadets of 2/9 Company NCC, we had undergone a month-long rigorous endurance training, all geared toward this trek. And here was the moment! All 23 cadets along with our ANO Lieutenant Sajina Begum and Caretaker Padmakumar boarded the Army canter along with Havaldar Prahalad. Our first destination was the Parambikulam Tiger Reserve. We reached there next morning after a long and bumpy ride. As we alighted from the canter, a cold breeze kissed our cheeks and made all that overnight travel fatigue vanish. The sights, smells and sounds were no less spectacular. The verdant greens, the moist earthy smell, the whooping call of a Nigiri langur were enough to cast a spell on us. After a warm welcome provided by the Parambikulam Tiger Reserve forest staff, we rushed to our dorms and freshened up. We quickly followed it up with a yummy lunch served at the Vangoli Café, run by the local community and headed to the Nature Interpretation Centre. We learnt that the tigers there hunt the biggest of preys – tigers have killed four elephants in Parambikulam in the past six months! – and feed leisurely over their kill for the next two weeks. The presentation also made it clear how this awe-inspiring animal keeps a check on the herbivore population and earns the title of ‘the apex species’. Along with our local guide Karthi, we went on a safari that evening. We were amazed looking at the rich biodiversity that the Parambikulam forests hosts. We sighted gaurs, spotted deer, peacocks and hold your breath, a leopard! Amidst the dying light of the evening, it walked majestically in front of our vehicles all of a sudden! Even before we could pick our cameras, it vanished into the woods! In the wee hours of the next morning, we woke up hearing the calls of the Malabar whistling thrush. We soon got ready and trekked to Karianchollai. Our 10 km trek gave us a first-hand experience of varied medicinal plants used by the tribal communities there. The thick canopy of the evergreen forest coupled with the umpteen leech-bites gave some of us an eerie feeling. But the brilliant hues of green and the thriving insect life made us just fall in love with nature. Later that day, we cleaned a tribal hamlet at Thunakadavu and collected 10 sacks of non-bio-degradable waste along with the local community. We also learnt how the forest department has empowered the forest dwellers by setting up small-scale industries in the form of honey extraction, paper bag production, plastic re-cycling, eco-shop etc. On our way back to the dorm, we heard a trumpet! As our eyes searched for the source of the sound, and our vehicle took a turn near the corner, we came right in front of an elephant! As they say, he was a gentle giant. He paved the way for us and went after his herd. Once we reached, we were taken for a meet with the DFO Anjan Kumar. He briefed that youngsters like us need to consider Indian Forest Service as a career choice. Even if it were not to be the case, he remarked that as citizens of the country, we need to raise our voice to protect the forests. The next morning we saw a peacock spread out its feather and put up a performance for its pea hen. All we could say was ‘Awwh!’. Then we posed in front of the picturesque dam of Parambikulam, saw the 480-year-old Kannimara teak tree, and did a bit of shopping at the eco-shop. After bidding good-bye to the warm forest staff, we left for Ooty, late noon. We reached Kalhatti, Ooty around 11:30 pm and hit the bed. The next day, we trekked over 15 kms and had breath-taking views of the Nilgiris from two different peaks. Just as our energy levels seemed to be dipping, our local guide Raman took us to his estate and asked us to how many oranges we could pluck. Well, ‘rampage’ might sum up the story. Early next morning, we boarded our canter and left to Avalanche. We had wildlife conservationist Rangasamy lead the affairs for the next two days. In his company, we learnt how the shola forests of the Nilgiris Biosphere Reserve play an incredible role in the hydrological welfare of south India. After our trek to Kolaribetta and Lakadi, he shared many of his lively wildlife photographs and made us realize the mighty and the delicate side of nature. On our bird watching session at dawn next day, we heard a squeaky sound from a thicket. As we sharpened our eyes and ears, we found a red-whiskered bulbul’s chick struggling to get on to a branch from which it seemed to have fallen off. We anxiously stood still and observed the unfolding drama. A sprightly adult came around and egged the chick to get back. And yes, it worked! Obviously, it was the mother, our guide clarified. On the final day, we were given a Snake Awareness Programme by Mr. Sadiq Ali at Cairn Hill, Ooty. The Tamilnadu Forest Department had arranged the show for us and we truly got into a world of snakes! We got a chance to see snakes like mountain krait, rat snake and even a spectacled cobra. Some of us even handled them in our own hands and got to know that they don’t harm unless they are harmed. As we rode our way back to Bangalore, exchanging photos, experiences and memories, I realized that it is this that every youngster needs. Fun, adventure and experiential learning! I must register my gratitude to Christ University and 9 Karnataka Battalion NCC. And of course, it was the Tiger Trail and we didn’t cite a tiger. But I’m no ordinary tourist anymore, I understand the workings of nature! 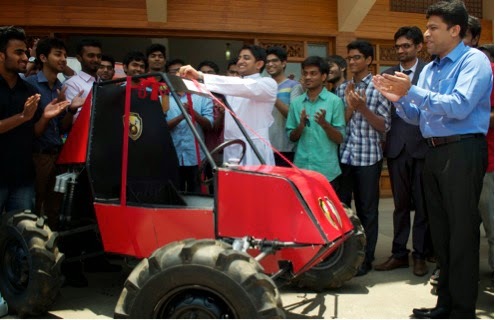 CUFE Campus witnessed the inauguration of ‘The All-Terrain Vehicle’ and the first Industry internship in campus, in association with ELITE TECHNO GROUP on 29-04-2015 at 12:00 PM. The Vehicle was formally inaugurated by Rev.Fr. Antony Puthuserry and then followed by a test trial. The workshop commenced on 15/04/2015, starting with the design phase which extended till 20/04/2015. 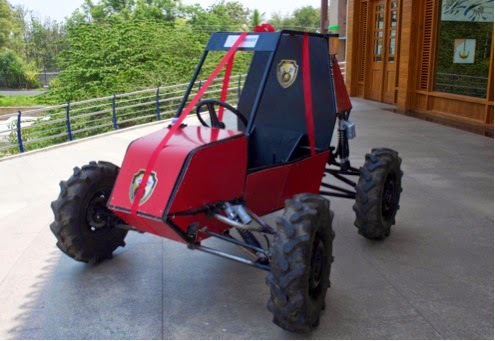 A total of 32 students were involved in building this vehicle starting from scratch in association with the faculties from Elite Techno Groups, Jaipur. The vehicle is powered by 190 CC Briggs and Stratton Engine which gives a power of 6.5 bhp .The fabrication phase started from 21-04-2015 and it was completed on 28-04-2015.There was an overwhelming response from the students as they were exploring the practical aspects in building this vehicle. 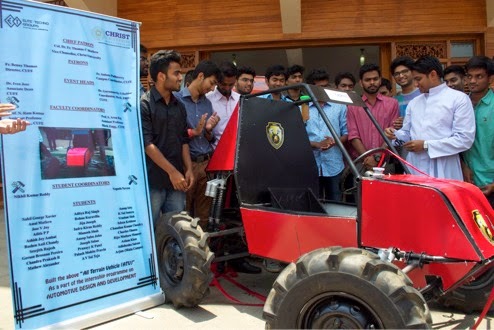 A team of 25 students will be selected by the faculty (internal) from this internship programme (based upon their performance in the internship) and those students will be registering for the event SAE BAJA : A national event conducted by SAE (Society of Automotive Engineers).